(from RTT News) – With a potential government shutdown looming, Senate Democrats voted Tuesday to block a short-term government funding bill. The Senate held two separate votes on moving forward with the stopgap spending measure but fell short of the sixty votes needed both times. The short-term continuing resolution would fund the government through December 9th and provide $1.1 billion in supplemental funding to combat the Zika virus. The bill also makes $500 million available to address immediate disaster recovery needs due to flooding in Louisiana, West Virginia and Maryland. However, most Democrats opposed advancing the bill due to a lack of funding to address the drinking water contamination crisis in Flint, Michigan. Some Republicans also voted against the motions. 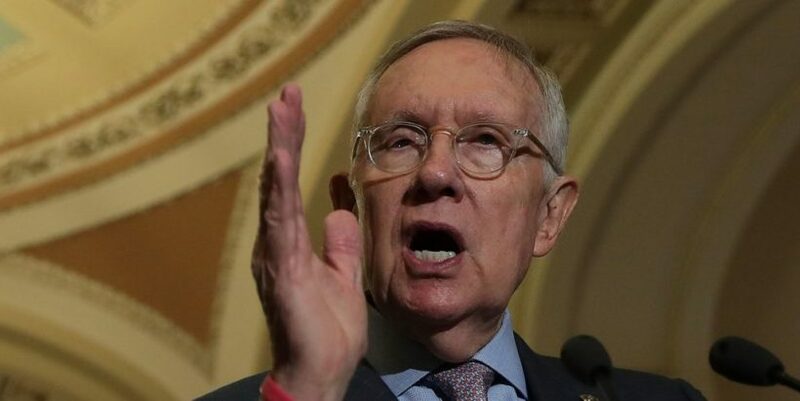 Senate Minority Leader Harry Reid, D-Nev., accused Republicans of ignoring the people of Flint and noted the Senate overwhelmingly passed a water infrastructure bill that included money for the city. Democrats also oppose a provision in the continuing resolution that would prohibit the Securities and Exchange Commission from finalizing rules on the disclosure of corporate political spending. Meanwhile, Senate Majority Leader Mitch McConnell, R-Ken., accused Democrats of playing politics with people’s lives ahead of the upcoming elections. Republicans have argued that any Flint funding should be included in the water infrastructure legislation, although the House version of the bill does not include any money for Flint. Reprinted here for educational purposes only. May not be reproduced on other websites without permission from RTTNews .com. 2. If Republicans hold the majority in both houses, why were Senate Democrats able to block the bill? 3. a) Define supplemental appropriations (spending). b) In addition to funding the government through December 9th, what supplemental funding is included in the bill? 4. For what reason did Democrats vote against the bill? 5. How do Republicans think the Flint funding should be handled? 6. What did Republican Senate Majority Leader Mitch McConnell say about the Democrats blockage of the bill? 7. a)Who do you think is right: the Democrats or Republicans? Explain your answer. Congress creates a new budget for our country every year. This annual congressional budget process is also called the appropriations process. Appropriations bills specify how much money will go to different government agencies and programs. In addition to these funding bills, Congress must pass legislation that provides the federal government the legal authority to actually spend the money. These laws are called authorization bills, or authorizations. Authorizations often cover multiple years, so authorizing legislation does not need to pass Congress every year the way appropriations bills do. When a multi-year authorization expires, Congress often passes a reauthorization to continue the programs in question. Authorizations also serve another purpose. There are some types of spending that are not subject to the appropriations process. Such spending is called mandatory spending, and authorizations provide the legal authority for this mandatory spending. Federal spending for Social Security and Medicare benefits is part of mandatory spending, because according to the authorization, the government must by law pay out benefits to all eligible recipients. From senate.gov: Supplemental appropriation – Budget authority provided in an appropriations act in addition to regular or continuing appropriations already provided. Supplemental appropriations generally are made to cover emergencies, such as disaster relief, or other needs deemed too urgent to be postponed until the enactment of next year’s regular appropriations act.